List the usable character commands. Help on questions of engineering points. Setting of helplines for the alignment of the drawing. Using draw the vector data are input into the CAD and saved for further processing. With this the point data (X and Y coordinates and similar) are input, in that a position is approached with a cursor cross and the cursor key <L> or the key <Ret> are pressed. Alternatively, a valid coordinate can be input into the input line via the keyboard and acknowledged using <L> or <Ret>. First input a withdrawn position! A position always consists of two numerical values X / Y value or radius / angle (e.g. 50 60). The individual values are to be separated using a space ‘ ‘. figures after the decimal point can be separated using a comma ‘,’ or dot ‘.’ (e.g. 123,1 210,5 or 123.1 210.5). For the input of numbers the characters ‘0..9’, ‘.’, ‘,’, ‘-‘, ‘+’, ‘*’, ‘x’ are accepted. Several numbers must be separated, e.g. using space ‘ ‘ or every other character which is not permissible as number. Only if precisely the same number of words have been input as the program demands, is the input accepted. The number input can be combined with the basic type of calculation. Values which are to be calculated must be written coherently. Bracketed operations or several consecutive arithmetic operators (10*-0.5) are not possible. The working off takes place in the order of the input. All arithmetic operations have the same validity. 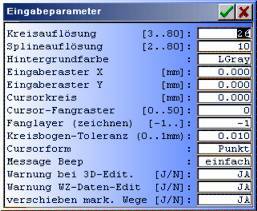 Settings for drawings in input parameters. You obtain the input parameters via the aid Input parameters left alongside the program aid and the layout selection. Circular resolution: Using Circular resolution you set the vectorisation resolution for arcs. All data are vectorised during input or after an export. The number of vectors is dependent on this setting and the current radius. Spline resolution: using Spline resolution you set the vectorisation resolution for splines (Bezier, Akkima, ..). All data are vectorised during input or after an export. the number of vectors is dependent on this setting. Using Input grid X/Y the cursor input takes place in the specified step width (gridding). A gridding is only activated if the grid is visible on the monitor screen. Using Cursor circle you can position a circular aid which is controlled together with the cursor. With the input Cursor circle > 0 in the CAD the cross lines with circle is drawn with the radius. Using the Cursor capture grid the joining with the nearest point in the grid can be activated for various character functions. The setting takes place in graphic points (screen grid points). Using Capture layer (draw) you can select a layer on whose content it is to be captured. With the setting -1 it is a captured in the ActLayer (layer in which it is drawn). Input, edit, activate etc. helplines for the CAD. Capture the graphic and text inputs on active helplines. For the helplines ‘display: one’ must be switched on. With Input parameters . Cursor capture grid> 0 the helpline is captured on the next graphic position in the capture grid. New horizontal/vertical: Input a newhelp line. Image frame: Create helplines for the working limit (set using Layout . Limits). Centring cross: Create helplines for the centring axis (set using Layout . Limits). Displace: Displace an existing helpline. With <Rem> the current (marked in black) helpline is deleted. delete all: Delete all helplines. Display: one/from: Display or conceal helplines. Capture: one/from: Position inputs using the cursor are captured on the next helpline. With a click on the rule in the graphic area a new helpline is created. A click on the horizontal rule creates a horizontal helpline. A click on the vertical rule creates a vertical help line. With a click (in the capture interval) on a helpline, the helpline is activated (black) and can be displaced (as per the function displace) or using <Rem> deleted. If no helpline is in the capture area the help lines selection is activated. The engineering aid can, as a supplement, be used for the input in draw. Using this, the target point can be input more quickly and more accurately. The engineering aid is started with an activated function in draw using <M> or <F2> or <Sft> and the right Mouse key <R>. The functions of the engineering aid (input of the target point). End point: Select start or end point of a vector. Vector middle: Select the centre of a vector. Object middle: Middle of the section(s)/contour(s) to be selected. Interface: Interface of two vectors. The interface can also lie outside the vectors. Intf. on vect. : Interface of two vectors. The interface lies on the vectors. Lot on vect. : Lot on a selected vector. Next: Captures on the next vector or end point. Cutting edge object: Extend the started vector out to the object to be selected. Extreme point: Extreme point of the section(s)/contour(s) to be selected. Main direction: Input of horiz./vert./45° to the last main points. Main points are end + middle of the last vector as well as middle of the last section or contour. Middle 2nd point: Capture at the middle between 2 end points.